How did our little show with its solid history in the use of sound and music become this big television event, scored in such a wonderful way? It's really an achievement. This is a lush soundtrack with Gold certainly remaining inventive even whilst fully embracing the use of orchestra and choir. It's certainly worth getting this CD if, like me, you do want to hear the full range of the music which when married to the overall soundtrack often gets suffocated in the mix. You only get the tip of the iceberg on telly and I feel this is an opportunity to get closer to the music. The early highlights for me are certainly 'All The Strange Strange Creatures' and 'Martha's Theme'. The former a surging, building theme that underlines the nature of the journey and the battle between good and evil and the latter is so wonderful with those vocals from Melanie Pappenheim. 'Boe' is so lovely. Again, the choral motif really sells this along with the acoustic guitar and the string sections. It captures something about the wisdom and ancient foreknowledge of the character. I'm not so keen on the music for 'Evolution Of The Daleks'. I just feel we've been here before with all the choral chanting, which is obviously a motif for those denizens of Skaro. I like the songs and feel they add a fresh dimension to the series and look forward to hearing more in the fourth series. Certainly, they work as period pieces like 'Devil In Me' used for 'Daleks In Manhattan'. Although, I think I prefer the Miranda Raison vocal for some reason. 'The Stowaway' isn't bad either and it'll be intriguing to see how this fits into the Xmas Special. The centrepieces of the CD are for me the music for 'Human Nature/Family Of Blood' and 'Utopia', 'Sound Of Drums' and 'Last Of The Time Lords'. For the former, Gold goes for an English pastoral feel with a romantic core, quite apt in the use of a smaller chamber orchestra. Very 'Beatles' influenced too if you listen hard enough. I'm all for the whistling - again this reminds me of the music for 'Georgy Girl' - very English psychedelia. 'Only Martha Knows' is brilliant as it goes from tenderness and Martha's nonchalance to a restless, surging and dark undercurrent with those fantastic string sections and the percussion. An utter delight. The restlessness is further underpinned in the following two tracks, great use of driving percussion and strings, very reminiscent of Bernard Hermann and with some great brass flourishes too. The military feel of 'Just Scarecrows To War' with the drums and woodwinds is superb and really connects to themes in the story which is what a good composer should be doing. Gold gets the real tragedy into 'Miss Joan Redfern' with that treated piano. You can feel the longing of the character especially when the woodwind and strings come in. Lovely and very moving. 'The Dream Of A Normal Death' is again exquisite in its exploration of the themes of the story - unfulfilled longing, love and 'what might have been' - with distant choral sections and strings and that treated piano again. 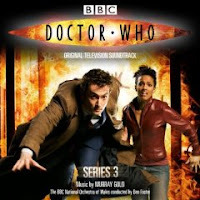 'The Doctor Forever' opens a further series of tracks that stand out on ths CD. A reprise of themes, including Martha's, with a great Irish jig motif, using some great brass, that captures the Doctor's energy and optimism. This takes us through a real range of musical emotions and concludes with a great fanfare. 'Blink' is subtle and tender. Worth it just for the use of bassoon to represent the disturbing setting of the story. It then powers up with strident strings in the middle and then plunges us back into the threatening suffocation of the angels. 'The Runaway Bride' is plain Hollywood pizzazz, with nods to Hermann and Waxman with its brass and strings. There's even a bit of Bondian Barry in there with the little trumpet motifs. And that incredible lift and soaring section when the TARDIS appears and the Doctor rescues Donna. It underlines that 'punch the air' moment. 'After The Chase' again has some subtle Barry like motifs and has his tenderness. 'The Futurekind' is fuzzy guitar, mad drums and pell-mell brass that forms the build up motif to the conclusion of 'Utopia' and I remember being impressed by this whilst watching the episode as it has the effect of building expectation into the audience. This is then echoed in 'Yana' with the return of the 'All The Strange Creatures' motif and some great wild vocals. 'The Master Vainglorious' is full of wild interpretations and devices, swirling strings, electronics and an almost 'Looney Tunes' simplicity with the underlying themes brought to a crescendo of brass, strings and those Oz like themes and rhythms. I love the graduating brass in 'Martha's Quest' and the twinkling bits of percussion and the sweeping strings that fall and rise and then restart. There some nice woodwind and brass sections that give us that epic scope to the character's journey. For me 'This Is Gallifrey' is stunning. The acoustic through line, the growing strings and strident percussion and brass that again fall back and repeat. Lovely woodwinds that develop the theme too with stirring strings that are full of lost pride and melancholy. We are truly listening to a lost and noble civilisation and the final corruption of the Master with the unfettered schism of the time vortex making its presence felt through punchy brass. Outstanding piece of music. 'Martha Triumphant' concludes the character's journey with a reprise of her theme but this time very cleverly giving us a finer, more mature sounding version that sums up the lessons she's learned. 'Donna's Theme' is great Gershwinesque brass and percussive playfulness, summing up the scatterbrained nature of the character and I hope some of this survives into the next series. A pity that more of 'The Master Tape' didn't find its way into the episodes. Great chugging strings and percussion that increase in speed over several sections. Brass punches and tinkly percussion, various stabs and accents that accumulate into stuttering conclusion. Is it me or does much of the music for the last three episodes have a mad, Wizard Of Oz, almost Looney Tunes quality to it? It sums up the Master's pathology very nicely. And finally, 'Abide With Me'. Lovely. Overall, a further testament to Murray Gold's fantastic work on the series, treat yourself to this CD, and to all the naysayers out there who have had doubts about his suitability for the job, well you can stick to Peter Howell playing the theme with paper and comb if you like, but this is epic, tender and soulful and you really are missing out on an essential element that makes the current series the success it truly is. You know, Mr. Gold, God love him, can use as many vocalists as he wants, but Melanie Pappenheim seems to steal the show from right under them. It's a comfort to know she isn't using her work here as a platform. The collaborations between composer and vocalist on Doomsday, The Doctor's Theme, Martha's Theme, The Doctor Forever etc are outstanding. No wonder she works with the very best.